Mainland Civil is a company with strong family and community values, having a deep understanding of and commitment to corporate governance requirements. As a good corporate citizen, we are actively involved in the wider community, its interests and activities; as such, we support numerous community groups both financially and through encouraging employee participation in community activities. Mainland Civil’s Board and Management are committed to the principles of ethical corporate governance. We are constantly mindful of our responsibilities as guardians of the natural environment, while performing profitably in the built environment and enhancing the amenity and quality of life of the broader community. Mainland Civil recognises that caring for our environment is vital; as such, we are committed to ensuring the highest standards of environmental excellence in everything we do. 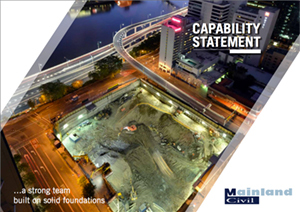 Mainland Civil is fully compliant with IS0 14001: Environmental, Management. Our achievements in environmental management have been recognised with peak industry awards over many years. We are committed to minimising our impact on climate change through auditing and controlling our greenhouse gas emissions, our overall carbon footprint and energy efficiency. Mainland Civil’s efforts in environmental excellence have been recognised through our successful participation in the CCF Earth Awards – the most prestigious awards in civil infrastructure – with our achievements including state winner and national finalist. Mainland Civil maintains prequalification criteria for all subcontractors and suppliers. All subcontractors and suppliers must have systems and procedures that ensure Mainland Civil’s quality and EHS requirements will be achieved on all projects without compromise. Subcontractors and suppliers must be prequalified to Mainland Civil’s prequalification criteria before commencing on site and are audited regularly to ensure adherence to our high standards.